These notebooks would also be a lot of fun for kids – if your reception is going to be kid-friendly. Each kid guest could get a notebook and some crayons and they’ll be entertained for hours. 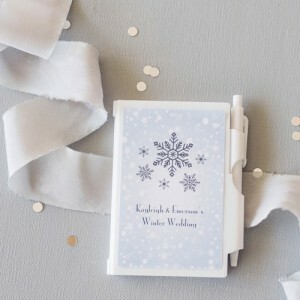 I also like the idea of putting baskets of these adorable notebooks near the door at the reception venue so guests could grab one or two on their way out. The notebooks are a fun way to remember the good times at your reception. You can find these personalized notebooks here.